Feeling a little sleepy today? The following article may not energize you, but it will certainly get you excited for bed. We've put together some of the best bedrooms, designed by the top professionals from around the world. 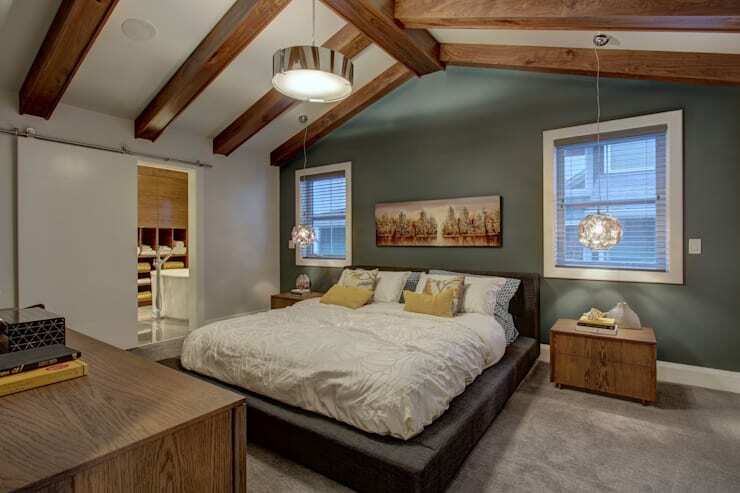 This Canadian bedroom features cozy wooden ceiling beams that add a traditional touch to a very modern bedroom. The dark grey wall adds an elegant splash of colour to the neutral tones while the sleek silver lamp that hangs down from the ceiling, merging functionality and charm. See more of this glowing home in Calgary. A headboard is the easiest way to add some character and charm to a bedroom. 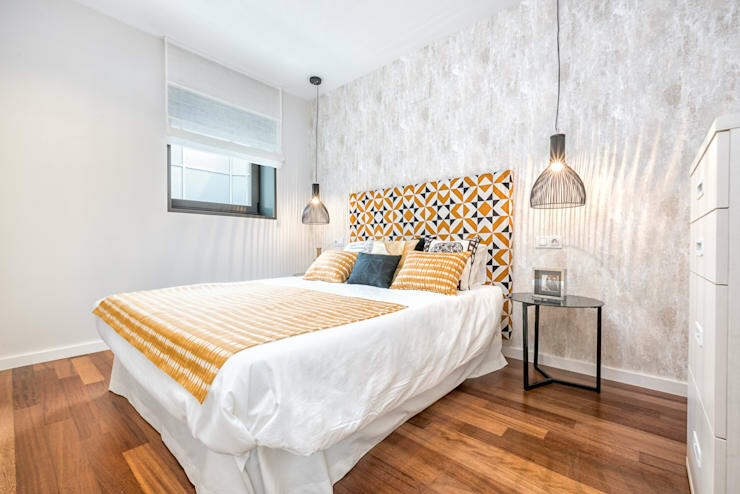 In this example, we can see how yellow and blue patterns bring a unique style to the trendy bedroom. Paired with the industrial chic lamps that drop down from the ceiling and the result is a stunning sleeping area. Wood has the ability to transform a bedroom into a little haven of warmth and charm. 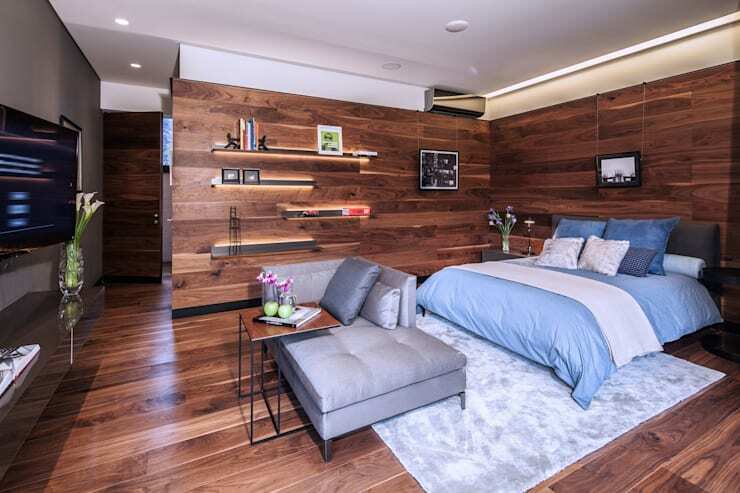 In this bedroom, the designers have gone for wooden floors and walls, enveloping residents in tranquility. Don't you love the shelves on the wall, which hold all sorts of books and picture frames for charm and personality? Now this is a very unique bedroom! 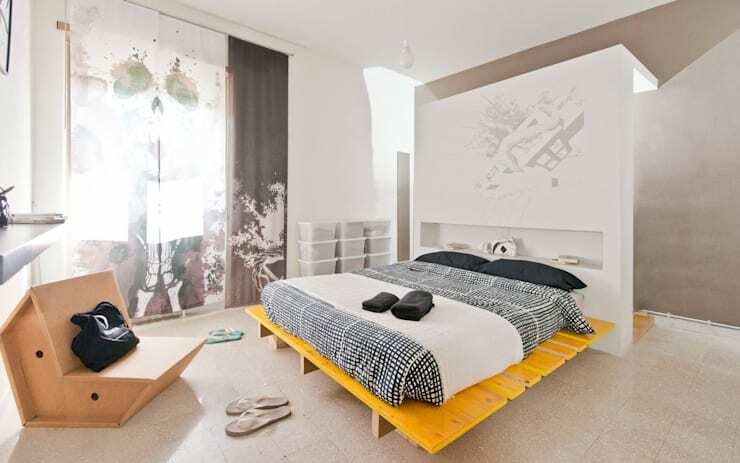 It features a bright yellow base, made from recycled pallets. The rest of the bedroom features black and white tones, with carefully selected artwork. Natural light streams in through the large glass windows and doors. Sometimes all you need to create a charming bedroom environment is a cushy and cozy rug. In this bedroom, we can see how it brings a warm and functional touch to the blue and white space. A canopy can be considered a little old-fashioned, but if it's done right, it can look simply stunning! In this bedroom, we can see how the canopy brings a romantic feature to the bedroom. The bed looks like it comes out of a fairytale. This is a room that guarantees sweet dreams. This Japanese-inspired bedroom is incredibly beautiful and filled with character and charm in a very peaceful and serene way. 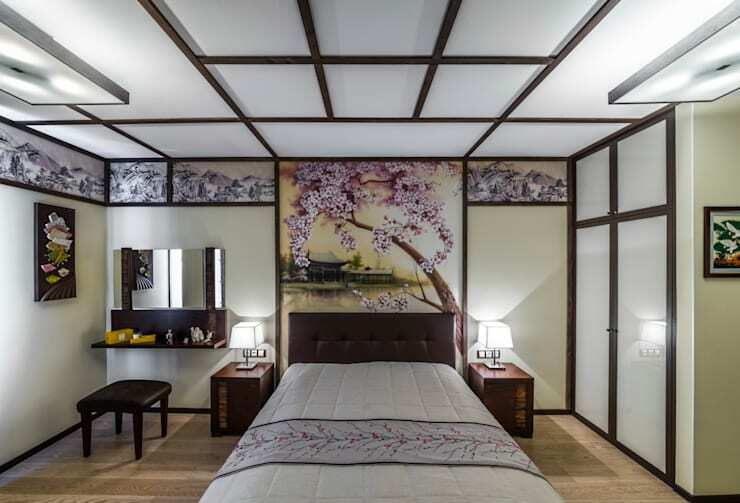 The walls and ceiling are made of white screens while images of Japanese gardens, houses and flowers line the wall behind the bed. With the soft bedside lamps and patterned linen, this is a room you'd feel calm in no matter what. Have you ever seen something so unique? 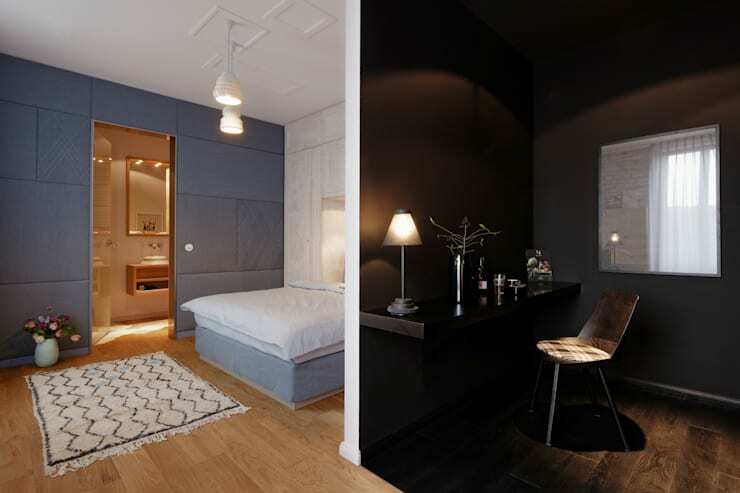 The bed sinks into a beautiful blue base, which is emphasized by the stunning artwork on the walls. The lamps that drops down from the ceiling features a patterned lampshade, which once again shows how functionality and style work together. Your bedroom doesn't need a lot to look stunning – a few carefully selected features go a long way. The bedroom in this home is gorgeous with its patterned wallpaper. Wallpaper is a very simple design element to install and looks fabulous when it's done! 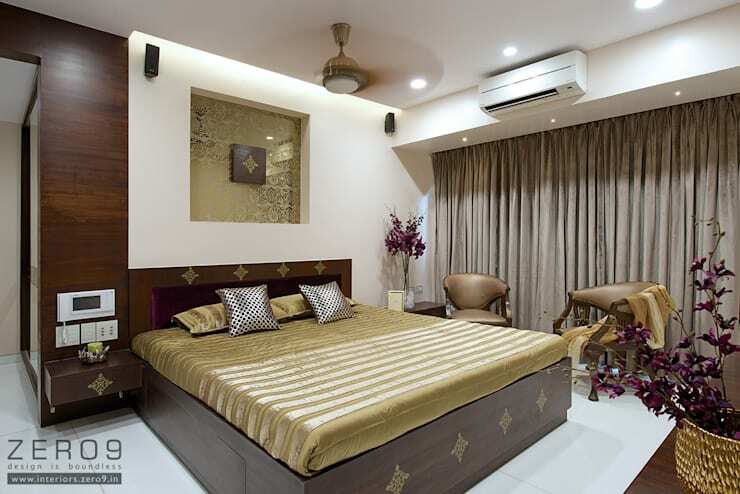 In a bedroom, it is a simple way to add beauty to the walls. For an elegant or more luxurious look and feel, opt for gold and silver for the colour scheme. 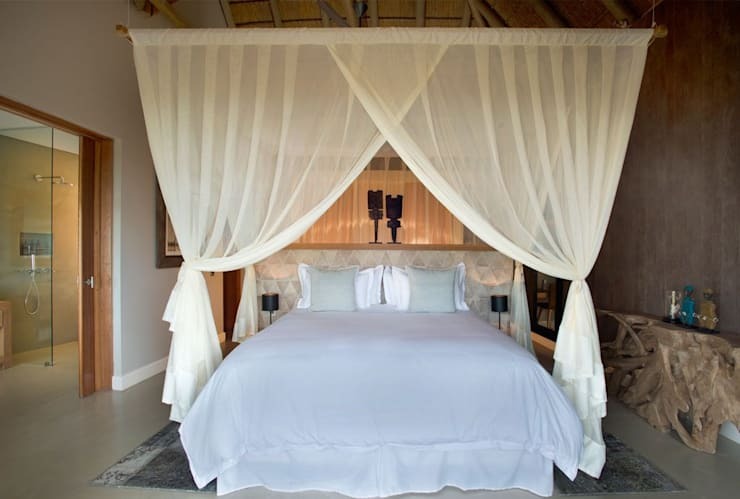 You'll feel like royalty every time you go to bed! Which bedroom would you want for your home?